This entry was posted on Friday, January 7th, 2011 at 5:11 pm by Manolo the Shoeblogger and is filed under Boots, Fashion, Fashion History. You can follow any responses to this entry through the RSS 2.0 feed. Both comments and pings are currently closed. I love those boots! Very Fluevog-esque, only better. The boots are perfect!! I’ve been looking for a pair like that for years with little success! I have a copy of a wonderful book, “Elegance, The Seeberger Brothers and the Birth of Fashion Photography” and checked out what was happening in Paris in 1916. Now, I admit that the Seeberger Brothers were taking pictures largely of professional models or celebrities of the period and there were actually not many pictures from 1916. 1914 – yes and the clothing was ankle length. But in Paris in 1916 (and of course, Paris was the center of the universe in terms of fashion then), skirt lengths were lower calf length. Those skirt lengths were just under the knee – those Metropolitan Railway lasses were definitely ‘skirting’ scandal with their skirt lengths. The boots, of course it goes without saying, are to die for. The entire uniform is clever, feminine, modern, and cheeky. I’d wear it in an instant. I’ll bet it came with a cross-body bag as well. I misread this at first and, based on the skirt lengths (despite the shape) and fitted jackets, thought the photos were from the Second World War. Those are indeed some risque skirt lengths for 1916. 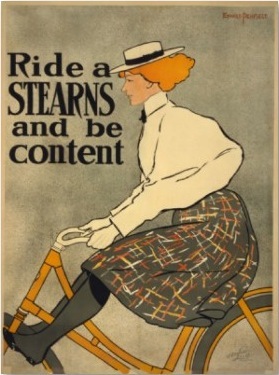 This Stearns Bicycle ad is from 1896. The skirt is not yet the knee length of the lady railway guard, but it is getting there. The reason for the shorter skirt is for safety as well as practicality. Note how the boots cover all of the calves and it’s likely that these ladies were wearing thick dark stockings as well. The wide, but shorter skirt assists these conductors in their jobs (note picture one). They could never have done this job in ankle-length skirts. Safety concerns were my first thought with regard to the skirt length as well. More generally, where, oh where, would one find working uniforms of such style and elegance today? Ill-cut polyester–feh! Fluevog Mini Babycakes to be exact! The boots are indeed excellent. But has the Manolo considered that some of us women prefer to wear pants? I find the modern woman’s trousers unflattering, but that is a matter of the particular garment, not pants generally. And the tie, is it not a whimsical and colourful accent? There is also the fact that in winter time, pants are far more practical. Even with high boots and tights (and bloomers, or any other woolens one might add to one’s bottom), pants are simply warmer than skirts. Particularly when one has a job involving standing outdoors on a railway platform, at the mercy of the wind. As soon as the Manolo wrote the final paragraph, he immediately thought of the two counter examples (i.e. the usefulness of the trousers, and the preference of some women for them) which could undermine his argument, both of which were rightly cited by his internet friend Caia. Indeed, the Manolo considered briefly including the sentence or two expressing his thoughts about these caveats. However, he decided to let the final paragraph stand as written, because the problem is not with the women who prefer to dress in the pants, or believe pants most suitable for the particular job, for these women are already having their desires met. They are wearing the pants at work. The problem, however, is for the large number of the women who would prefer to wear the more womanly, fitted and tailored clothing, but who are forced into the manly clothing because their occupation is perceived as being the masculine one. The modern woman in uniform has been a pet peeve of mine forever. Why must women cops and postal workers wear the same trousers as the men? They look uniformly awful. Toby, I own that Seeberger book as well and it is wonderful. I also own several books on shoe history, and I do believe in both the cases of the vintage boots, that those are actually spats. Not that that makes the look any less fabulous, but that it may make it easier to replicate. Thank you for the vintage shoe pics, Manolo! John Molloy, the much-maligned statistician, tested various uniforms for women, and the results were indeed uniform: women in skirts are perceived as being more authoritative than women in pants, by both men and women. For a train conductor, this is obviously an important consideration. As well, we now have leggings and tights that are as warm as pants (I’ve jogged in Winterpeg, I know what I’m talking about) that aren’t bulky and can be perfectly appropriately worn under skirts. I say bring them back! The problem of the modern woman’s uniform has a double core: it’s not just that women are now uniformed in practically the same clothing as their male counterparts, it’s that their clothing says they are expected to do the work they do exactly as the men do (as if the men doing the job are the norm, and the women, the aberrations). The other core: uniforms are universally cut from cheap patterns (low on design and fit, something you can easily slap together for reasons of cost) and made from very cheap fabrics. I can see from here the modern Amtrack she-outfit is 100% polyester, it just hangs off the body like sacks with pleats, right down to the plastic kerchief. The Hello Kitty bag is the most expensively made part of the woman’s outfit, and it is not part of the uniform. The whole look tells us Amtrack doesn’t think much of their employees’ abilities and skills, but it’s got to have a uniform for branding purposes, so this is it. You can tell this lady isn’t paid much–and neither are her colleagues. And she probably takes a lot of guff from the public, who see her as some minimum wage service industry employee. If you want a staff that looks authoritative, competent, and valued, you’d use the most appropriate fabrics and designs that would play up the very best features on anyone who puts the uniform on. That early train conductor uniform is made of warm (English, no doubt) wool, the boots are leather with good soles that can be replaced, and they are likely bespoke (this is Britain we’re talking about anyway). No one would easily challenge her, the boots alone would give most people warning enough. Chances are good she’d also be paid decently because the work she did was valued. Not as much as the men were paid, of course, but certainly more than she’d have earned doing jobs most women did. The Amtrak girl doesn’t look too bad, because she is young, pretty, and slim–although I would take those pants to a tailor and have them fitted properly–and also have those shirt-sleeves shortened slightly. For women who are older or who have figure flaws, the Amtrak uniform is a disaster. Pants have a way of emphasizing, not hiding (as many women think) less-than-perfect figures, unless they fit perfectly and are absolutely the right style for the wearer. I think that Amtrak and other entities choose polyester for uniform fabrics because they assume that their workers don’t want to spend money on dry-cleaning. What a mistake. @Raincoaster: I agree with John Molloy. Skirts on women project authority; pants don’t, even on Hillary Clinton. As an off-and-on college teacher, I have a policy of never wearing pants in the classroom, and I also always wear conservative shoes with closed toes and little heels. I want to look like a schoolmarm. Are those boots? or are those oxford shoes with gaiters/spats? In fact, Charlotte, I suspect that most Amtrak workers do NOT want to spend money on dry-cleaning, as they probably don’t get paid handsome enough salaries to do so. Surely the upper management knows what workers are being paid, and I sincerely doubt they’re willing to give workers a pay raise in order to care for dry-clean-only fabrics. I do want to quibble with the notion that pants are “masculine” and skirts “feminine”. Any sensible person can come up with exceptions to these rules in no time (the kilt and the salwar kameez come to mind). Trousers cut for the men are indeed unflattering on most female physiques, but then the reverse is also true. Try putting a long silky Kate Hepburn wide-leg pant on a man and he will look a bit silly, won’t he? I don’t think it’s a matter of feminine or masculine: the cheaply cut polyester uniform flatters no-one, man or woman.